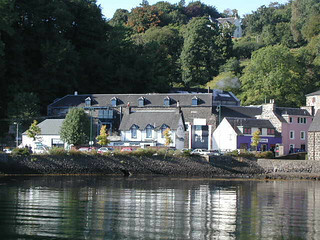 Mull's largest resort, built in the 18th century. 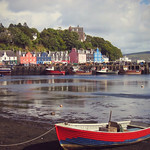 Tobermory's a classic fisherman's village whose multi-coloured houses are picture postcard pretty. There is no prettier port in the west of Scotland than Tobermory, Mull's main village, which is set on the side of a steep hill in a wooded, sheltered bay. 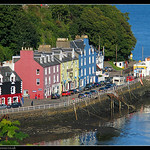 The brightly painted houses that line the harbour front date from the late 18th century when the British Fisheries Society built Tobermory as a planned herring port. It never really took off as a fishing port, however, and nowadays you're more likely to see pleasure yachts anchored in the protected waters of the natural harbour. Lying at the bottom of the harbour is a galleon of the Spanish Armada, which sank in mysterious circumstances, along with its treasure of gold doubloons which has eluded salvage crews ever since. 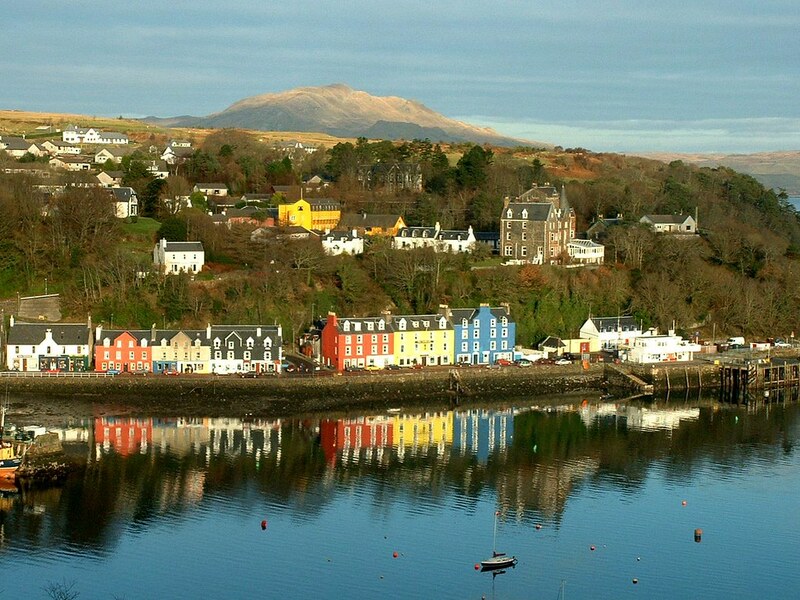 Tobermory is the only Highland town to have a Womble named after it, and of course it was the location for the well loved children's TV programme, Balamory, and many of the colourful houses featured on the programme. The best eating in Tobermory is to be had in the Western Isles Hotel (see above), where you can choose between 3 restaurants. A 3-course à la carte in the dining room or the oriental Spices Bistro is expensive to mid-range, while cheap bar meals are served in the excellent Conservatory Bar. Not so stylish or tasty, but cheaper is the Highland Cottage Hotel on Breadalbane St, which does a moderately priced 4-course dinner. 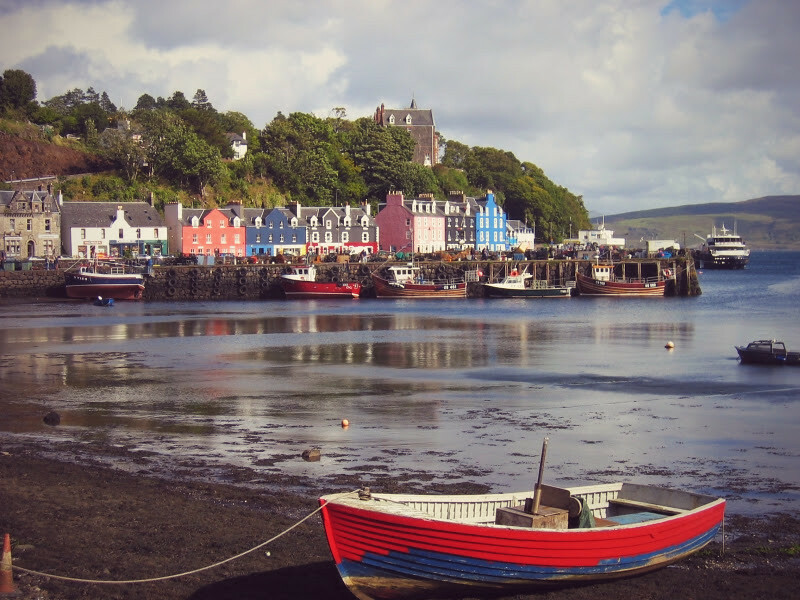 The harbour front is filled with places where you can eat your fill, including the bar of the Mishnish Hotel, where you can attempt to munch your way through their monumental portions and, if you're not sleeping on the same street, also attempt the walk uphill on an over-filled stomach. Also on the harbour front is the excellent Island Bakery. A worthwhile detour is to walk to the edge of town to the excellent Green Barn which is run by Isle of Mull Cheese (see below). Here you can enjoy good old home baking in the unusual surroundings of a plant-filled glass barn. Despite its popularity, Tobermory hasn't succumbed to the dreaded tartan disease that afflicts so many other tourist hot-spots. You're more likely to find shops selling fishing tackle or diving gear than tacky souvenirs, and the ones that do cater for the tourist market, such as Mull Pottery, Tel. 302057, and the Mull Silver Company, Tel. 302345, open 0900-1730, are tastefully done and enjoyable places to browse in on a wet afternoon. 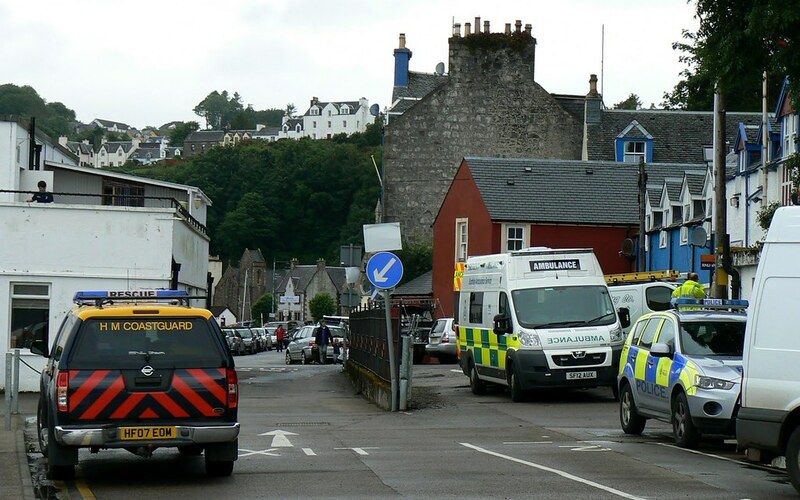 At the foot of Back Brae, which leads steeply up from the harbour to the upper part of the village, is the Tobermory Chocolate Company, Tel. 302526, open May-Oct Mon-Sat 0930-1730, where you can try out their speciality - chocolate made with the local whisky . On the edge of town, 500 yds off the Dervaig Rd, at Sgriob-Ruadh Farm, is Isle of Mull Cheese, Tel. 302235, where you can savour their award-winning traditionally made cheese and their wonderful glass barn (see above). Open Apr to end-Sep Mon-Fri 1000-1600. 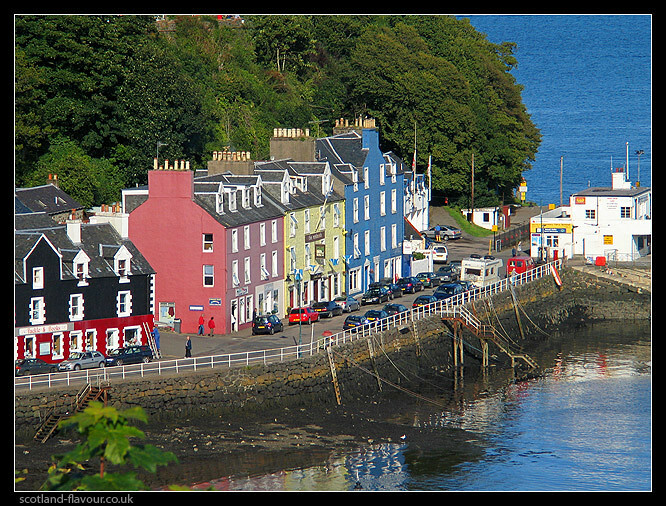 Tobermory is a 30-40 min drive north from the ferry pier at Craignure. 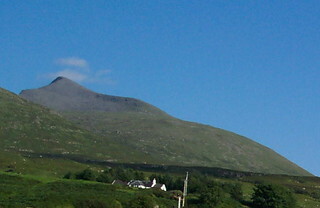 There are regular daily buses from Craignure which coincide with ferry arrivals. 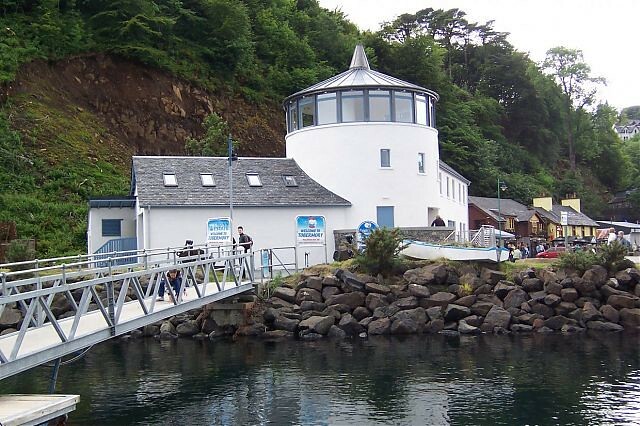 The Tourist Information Centre is in the same building as the CalMac ticket office, at the far end of Main St, Tel. 302182. It's open 6-29 Apr Mon-Fri 1000-1700, Sat-Sun 1200-1700; 30 Apr-1 Jul Mon-Fri 1000-1700, Sat-Sun 1100-1700; 2 Jul-2 Sep Mon-Sat 0930-1800, Sun 1000-1700; 3 Sep-28 Oct Mon-Sat 1000-1700, Sun 1200-1700. Mull's only permanent bank is the Clydesdale Bank on Main St. There's also a mobile bank which tours the island; for details Tel. 08457-826818. Internet access at the SYHA on Main St (£1.50 per 15mins), An Tobar (£1 per 15 mins), Posh Nosh above the CalMac terminal (£1.50 per 15 mins) and The Corner Store (£3 per hr). The harbour front - known as Main Street - is where you'll find most of what you want: hotels, guesthouses, restaurants, pubs and shops and the tourist office. Mercifully, though, it's free from the tartan tat that blights so many other tourist hot-spots. Here you'll find the Mull Museum, housed in an old bakery. It's worth visiting on a rainy day and you'll learn all about the island's history. Info - Easter-end Oct Mon-Fri 1030-1600, Sat 1000-1300. £1. Tel. 302493. 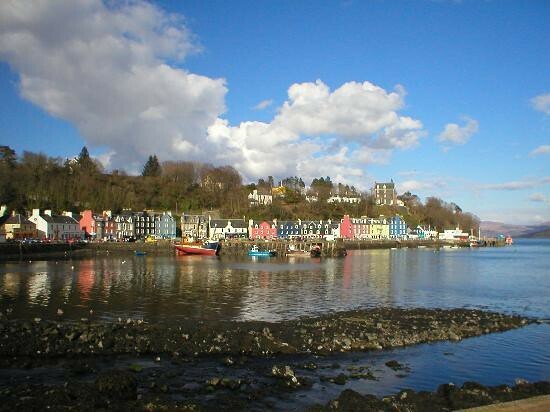 At the foot of the main road down to the harbour is the tiny Tobermory Distillery which offers a guided tour rounded off with a sampling of the island's single malt. Info - year-round Mon-Fri 1000-1700. Adult £2.50, concession £1, under 18 free. Tel. 302645. 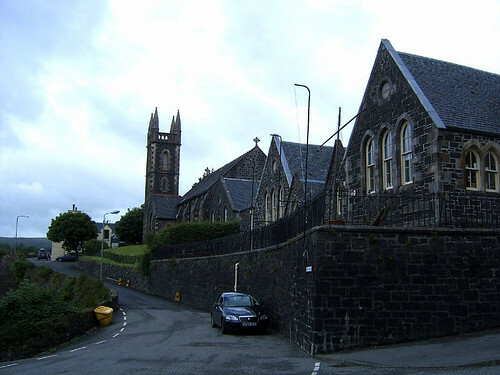 At the top of Back Brae, on Argyll Terrace, is AnTobar, an excellent new arts centre housed in an old schoolhouse and featuring a varied programme of exhibitions, music and workshops. Or you can just have a coffee and admire the view. Info - Mon-Sat all year 1000-1700. T302211. 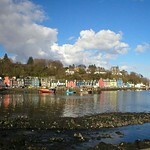 Whale and dolphin watching trips can be made from Tobermory with Sea Life Surveys, Tel. 302787. 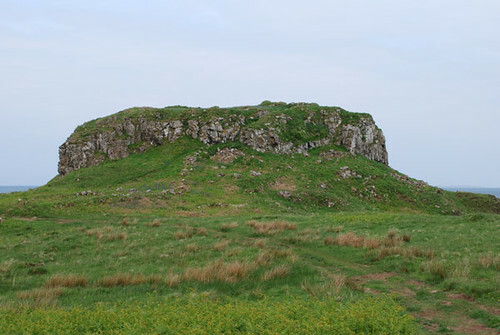 A full-day tour costs £45 (£48 in Jul/Aug), and there's a maximum of 12 people per trip. You can find out more at the Hebridean Whale and Dolphin Trust, a charity which aims to protect the marine environment through education, at 28 Main St, Tobermory, Tel. 302620, Fax. 302728, www.gn.apc.org/whales open daily 1000-1700 all year round. Fishing trips can be made with Amidas Sea Fishing & Wildlife Trips, based at Baliscate House (see 'Sleeping' above), or book at Tackle & Books, Tel. 302336. Trips cost around £15 for 3 hrs, or £30 for a full day. Permits for trout fishing are available from A Brown & Son, 21 Main St, Tobermory, Tel. 302020, Fax. 302454. 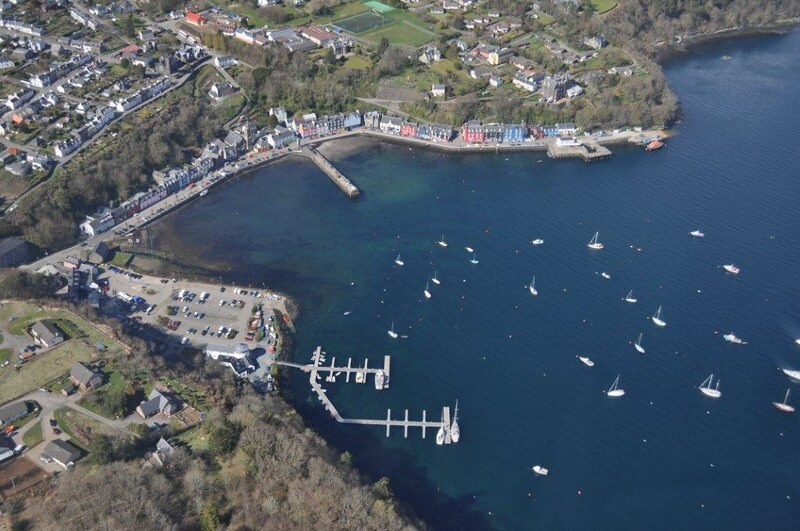 For more details pick up the Tobermory Angling Association leaflet from the tourist office. Diving trips and courses are available with Seamore Diving. 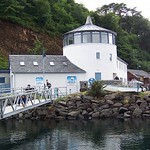 Book through Seafare Chandlery & Diving Service, Main St, Tobermory, Tel./Fax. 302277. Wildlife expeditions with Isle of Mull Landrover Wildlife Expeditions, at Ulva House Hotel, T302044 (David Woodhouse). Full-day tour costs £27.50/£19.50 per person. An absolute must when in Tobermory is a night in the Mish. After one of their pub meals and several pints of ale, bending over the pool table is an effort, not to mention getting down to some good live folk music. For the sake of choice, other pubs and live music venues are available, namely MacGochan's, at the other end of the harbour, near the distillery. There are also music events at An Tobar (see 'Sights' above). Ruinous castle on a sea stack with surrounding wall. Central keep on outcrop of rock. Can be visited at any reasonable time. Multi-displinary arts centre based in Tobermory in what looks like old school. Live Gigs and stream of activities. Well worth visit. 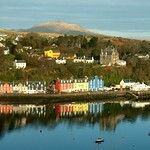 Check out the best deals for hotels in Tobermory with LateRooms here. Western Isles Hotel, Tel. 302012, Fax. 302297. 23 rooms. Open all year, the biggest and grandest hotel on the island, set high above the harbour with great views from the comfortable rooms, has 3 excellent restaurants, including the lovely conservatory bar. 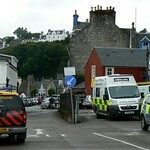 Tobermory Hotel, 53 Main St, Tel. 302091, Fax. 302254. Good value and great location. Also on the harbour front, close to the ferry port is the famous Mishnish Hotel, Main St, Tel. 302009, Mishnish Hotel Open all year, 10 rooms. Its bar is the live music focus of the town and social hub (see below). Best of the guesthouses on the harbour front is the excellent Failte Guest House, Tel./Fax. 302495. Open Mar-Oct, 7 rooms. Also on Main St is the SYHA Youth Hostel, Tel. 302481. Open end-Feb to end-Oct and rents out bikes. There are many guesthouses and B&Bs uphill from the harbour, which are often better value. These include: Copeland House, Jubilee Terr, Tel. 302049/302422. 3 en suite rooms with seaviews. Ivybank, Argyll Terrace, Tel. 302250. Friendly and comfortable. A short walk from town is Baliscate Guest House, Tel. 302048, Fax. 302666. 4 en suite rooms. 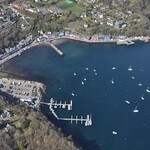 They also organise fishing and wildlife trips (see 'Trips from Tobermory' below). 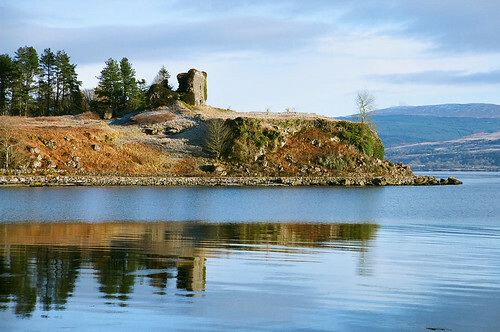 Six miles from Tobermory on the Dervaig road is Glencorm Castle, Tel. 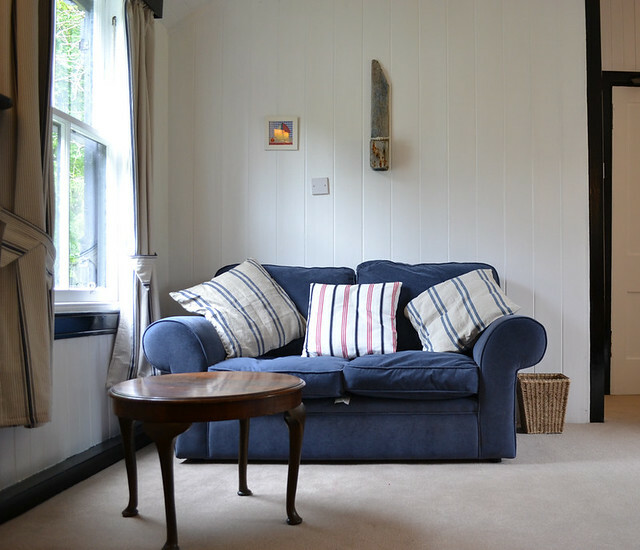 302321, a private house offering B&B year round.